The first thing to understand is the hacker mentality. They don’t think the same way you do and have diverging interests from the mainstream. They are more likely to be wearing a shirt from Think Geek rather than any sports team and are more likely to be talking about the latest science fiction film than the latest romantic comedy. Take the time to understand geek interests and what makes them tick. 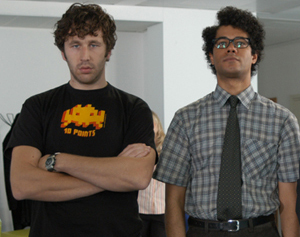 The best real representation of an IT professional is in the BBC program The IT Crowd , whose main characters are the IT department of a major corporation, and the dichotomy of Roy and Moss with people like their manager Jen. The show is a look at corporate culture from the basement up, while seeing what real IT is like through a fun house mirror. The show also has a lot of inside geek jokes and taking the time to get these small references, which appear in both the dialog and the background of the IT office, will take you a long way to understanding the hacker. As an entrepreneur with a startup or company that is working with a developer, do you have any grasp on technology beyond being able to bring up your e-mail on your Blackberry or iPhone? You know your startup needs a website and maybe an iPhone app, but do you know the basics of what is involved in it? Have you done research about the type of things you need done for the site? In most companies I’ve worked for, the CEO understands design and how the website works, but doesn’t understand what goes into the backend. The CEO of an online company once told me she wished that she could save money by getting rid of the entire IT department. An online magazine with no developers, IT support or anyone to handle anything beyond design or editorial. A ridiculous concept for a company whose entire existence is on the Internet, but one she firmly believed in. So how can the potential employer understand and communicate with the developer? The best thing you can do is educate yourself. There are blogs out there that will educate you on current technology, like Engadget and Gizmodo, but the best thing you can do is educate yourself about programming. Pick up a basic programming book or take a short course so you get the basics and know what you are looking for. For beginners, I recommend books like PHP for the World Wide Web or PHP & MySQL For Dummies (my language of choice is PHP, so I’m partial to it, but I find Peach Pit Press or the For Dummies series to be good beginner’s resources). Knowledge is the strongest weapon in your arsenal for dealing with people, so why wouldn’t you extend that to developers as well? The world of the developer can be daunting for the uninitiated. Not all programmers are anti-social diginauts, like Lisbeth Salander of The Girl with the Dragon Tattoo , but nor are they the basement dwelling Twinkee eaters, like Kevin Smith in Live Free or Die Hard . They are a community with their own lexicon and standards that may be incomprehensible to the outside world, and the best way to understand it is to try and crack the code. Sit down with a developer and actually talk to them, understand their universe and navigate the labyrinth.